The Professional Regulation Commission Board of Accountancy announced through its latest Memorandum that the results and official list of passers for the May 2018 Certified Public Accountant or CPA Board exams conducted at its designated testing locations around the country on May 13, 20 & 21, 2018 will be released on May 28, 2018. 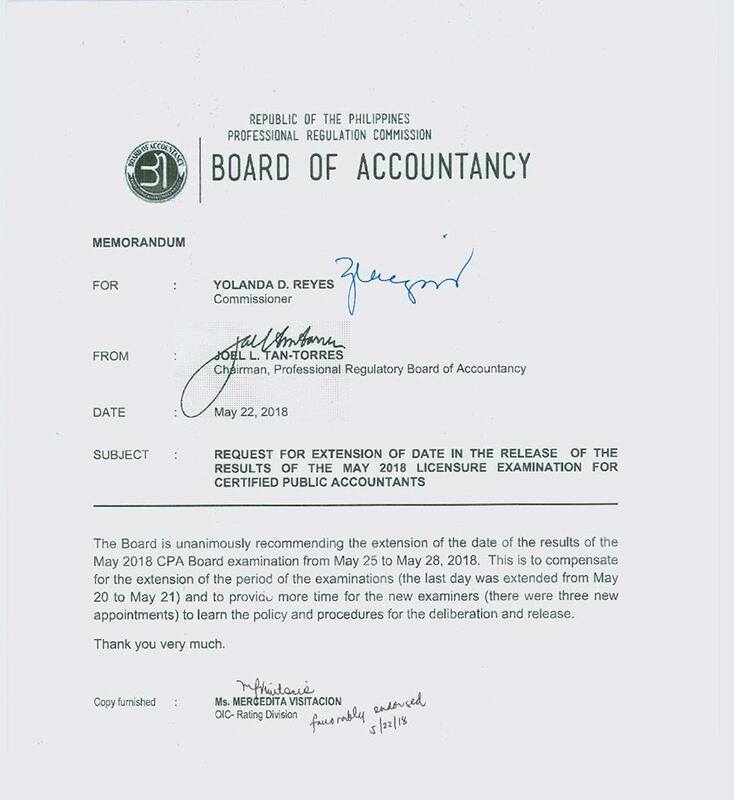 The board is unanimously recommending the extension of the date of results of the May 2018 CPA Board examination from May 25 to May 28, 2018. This is to compensate for the extension of the period of the examinations (the last day was extended from May 20 to May 21) and to provide more time to the new examiners (there were three new appointments) to learn policy and procedures for the deliberation of release. Image above is courtesy of PRC Board of Accountancy Facebook post. Meanwhile, here is the summary of results for May 2018 CPA Board Exam. For further updates on results, among other important announcements from PRC and BoA, we recommend our members to bookmark this page and follow us at our social media accounts via Facebook and Twitter.